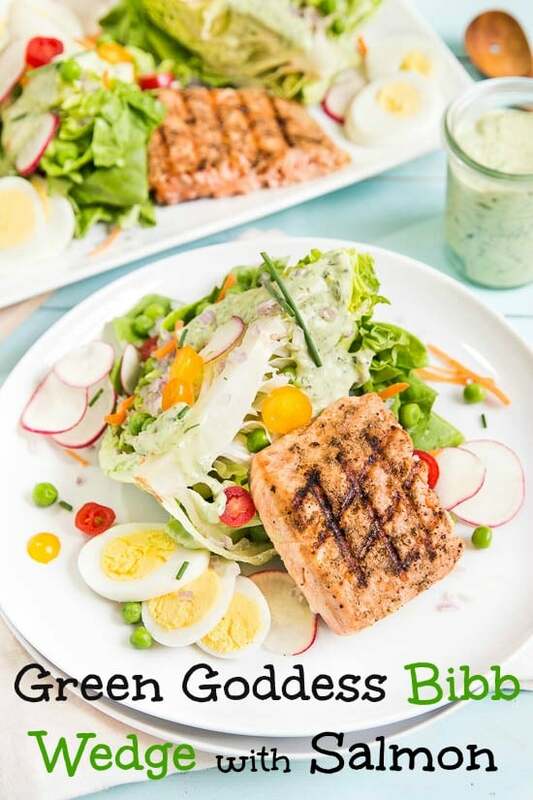 A twist on the classic iceberg wedge, this Green Goddess & Salmon Summer Wedge Salad is made with refreshing, crisp bibb lettuce instead. 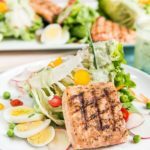 Topped with grilled salmon, fresh veggies, hard boiled eggs and a creamy green goddess dressing, this salad is a hearty and healthy! Y’all, I freggin’ LOVE it here!! Our house is awesome and tranquil, the Carolina atmosphere is relaxed and gorgeous, and the winding roads make me wanna say, “weeeeeeeee-eeeee!” while driving. I feel more at home here than any other city I have resided. Well, minus the mass chaos and clutter of endless boxes, of course! But, I have a dilemma and I need a little advice, my friends. As I am unpacking boxes, in my brand spankin’ new space, I don’t know where to put anything. I am lacking a clear vision. 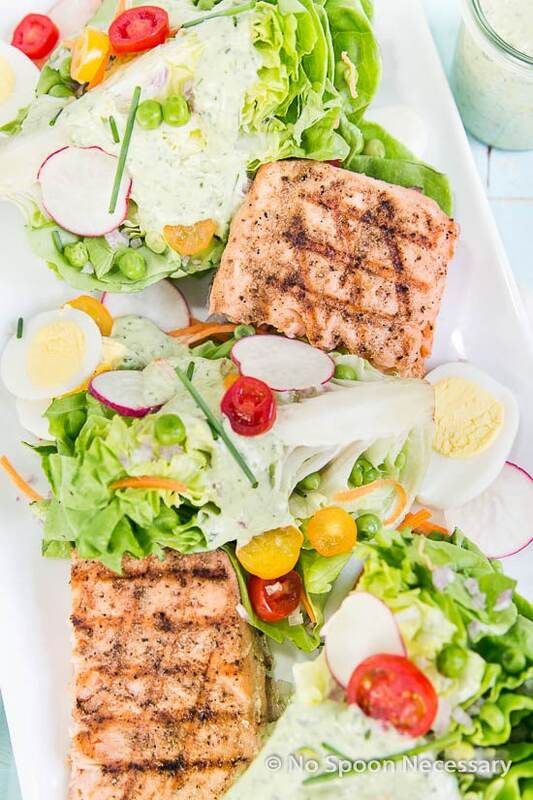 Anyways, on to today’s dish – Fully Loaded Bibb Wedge Salad With Grilled Salmon and Green Goddess Dressing. 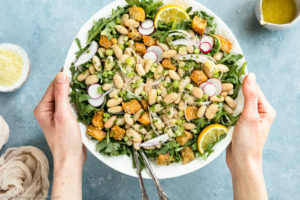 This salad is not only seriously scrum-did-a-lee-umptious, it is also easy and quick to throw together, doesn’t require you turn on your oven and perfect if you have lost your mind (like me) because it’s pretty dang simple. I wanted to shake up the wedge a little bit and do something slightly outside the norm. Therefore, I replaced iceberg with my absolute favorite lettuce. Ever. Like, ever. Ever. Ever. Bibb lettuce – or little gem, butter – whatever you want to call it or whatever you have available. 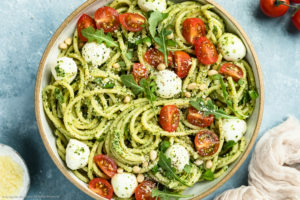 🙂 I also nixed the traditional blue cheese dressing and substituted dreamy green goddess dressing. 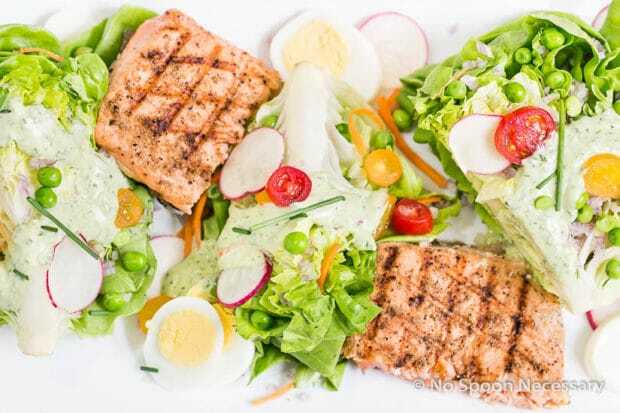 For toppings, I opted for summertime fresh veggies, hard boiled eggs, and simply grilled salmon for substance and a healthy dose of Omega-3’s. 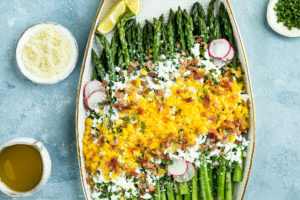 The result is a healthy, crisp, refreshingly cool salad that is packed with flavor – crunchy, creamy, tangy, herby, a little smoky- and all around finger lickin’ fantastically delicious. 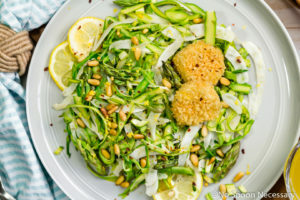 I am so smitten with this salad I have been eating it for all three meals- breakfast, lunch and dinner. Yes, I said breakfast. It is just.that.good. But, this wedge is also customizable. 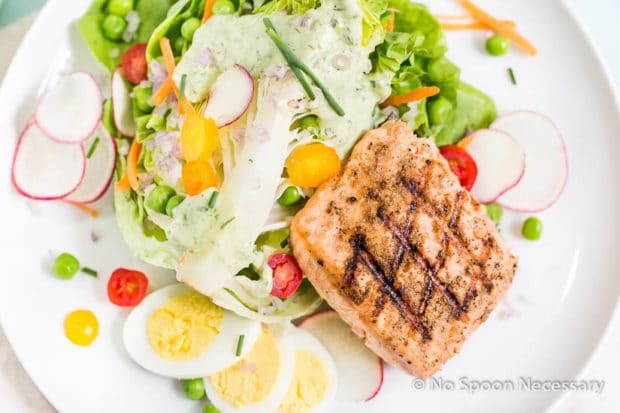 You can substitute the salmon for chicken, ahi tuna, steak, shrimp or tofu. Also, add or subtract whatever topping ingredients float your boat, just don’t 86 the dressing, it makes the salad. Some add-ins I have tried: sliced avocados, crumbled bacon, shaved Parmesan and freshly baked croutons. All of them rocked the house, so let your tummy be your guide! Regardless of how you top this green goddess bibb wedge salad, I know you are going to love it and possibly even crave it for breakfast. 🙂 Until next time, Cheers and don’t forget to hit me up with some home décor site suggestion- pretty, pretty please and thank you! Make the dressing: Place all ingredients in the bowl of a food processor affixed with the metal blade attachment. Process until smooth, stopping to scrape down the sides of bowl as necessary. Taste and adjust for seasoning. Transfer to a container with a tight fitting lid and set aside in the refrigerator until ready to use. Preheat grill or grill pan to medium high heat and oil the grates. Prepare Salmon: Rub each salmon filet lightly with olive oil and season generously with salt, pepper and Old Bay. 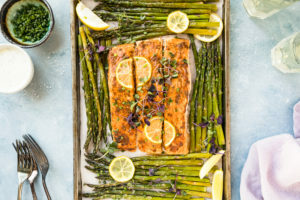 Cook Salmon: Place salmon, skin side down on grill and cook until golden brown, grill marks are charred into fish, and fish releases easily from grill, 3-5 minutes. Flip filets over and continue to grill until an instant-read thermometer inserted into the center of the filet reads 125 degrees F (for medium rare) or 130 degrees (for medium), about 2-3 minutes longer. Transfer filets to a clean work surface or plate. Tent filets lightly with aluminum foil and allow to rest for 3-5 minutes. 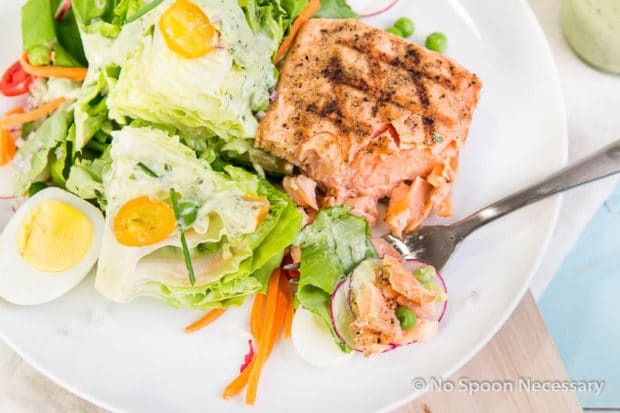 Plate the Salad: Cut the salmon into equal serving size pieces. 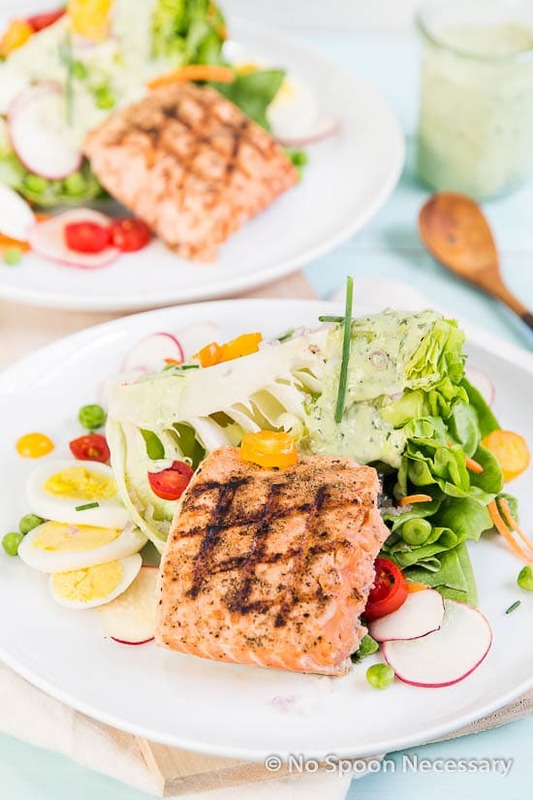 Place wedge(s) of lettuce and salmon filet on each serving plate. Top with radishes, carrots, eggs, peas, tomatoes and shallots. Drizzle with dressing, garnish with chives and season with crack blacked pepper. Serve and enjoy. 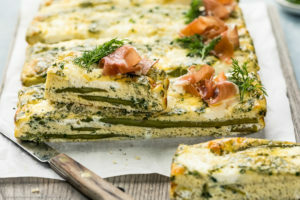 *Dressing will keep stored, covered, in the refrigerator for up to 5 days. 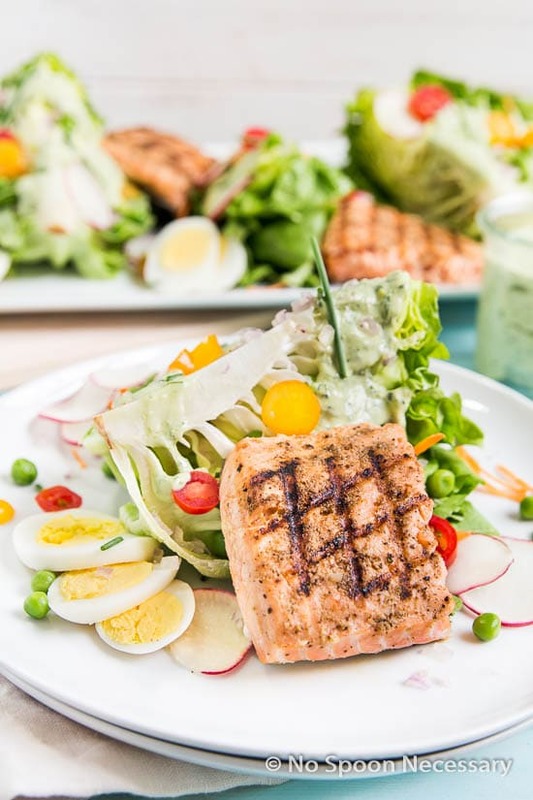 *Can substitute grilled chicken, steak, pork, tofu, tuna, or any of your favorite proteins for salmon.